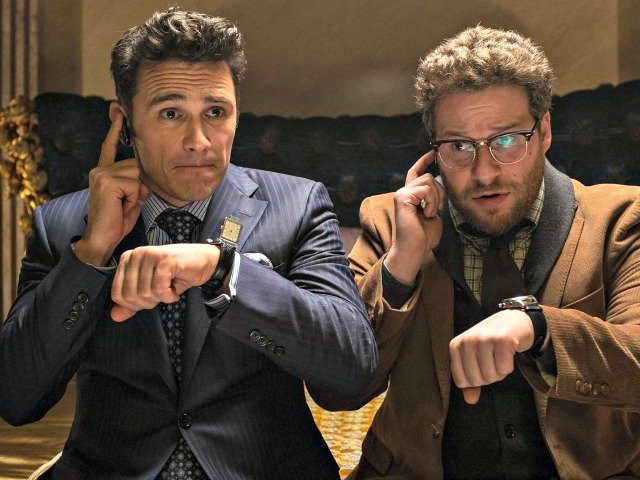 Seth Rogen and James Franco’s new film The Interview hits theaters on Christmas Day, and from the looks of the trailer, it will probably be as irreverent, politically incorrect, and unexpectedly funny as the rest of their movies. The film follows Franco, who plays a tabloid show TV anchor, and Rogen, his producer, as they travel to North Korea for an exclusive interview with the country’s notoriously tight-lipped leader, Kim Jong Un. Once the U.S. government finds out the pair will be in the same room alone with Kim, they enlist them in an effort to assassinate the leader. “The cheekiness to show this conspiracy movie, which is comprised of utter distortions of the truth and absurd imaginations, is an evil act of provocation against our highly dignified republic and an insult against our righteous people,” the article read, according to the Hollywood Reporter. Ironically, in a June interview with the Telegraph, a spokesman for Kim said the North Korean leader would probably watch the film anyway. This despite the fact that “the U.S. is desperately scrambling to tear down the authority of our republic that grows mightier by the day, with a shabby movie, now that no pressure or threat has worked,” as the most recent article said. Rogen, for his part, doesn’t seem to be taking the threat all that seriously; on Tuesday, he invited his fans to get high and watch the film with him in a Colorado theater that allows smoking weed inside.